Sorry to get all Brick Tamland on you, but “I love lamp”. There’s seriously nothing better than curling up with a good book on the couch beside the warm glow of a side table lamp. Lighting can set the vibe for an entire room. The good news is, you don’t need to spend all your savings on expensive lighting, either. There are just too many luxe-looking lamps with smoky glass finishes, timber bases and on-trend designs out there, many of which will fit within your budget. Here are eight table lamp options to light up your life. 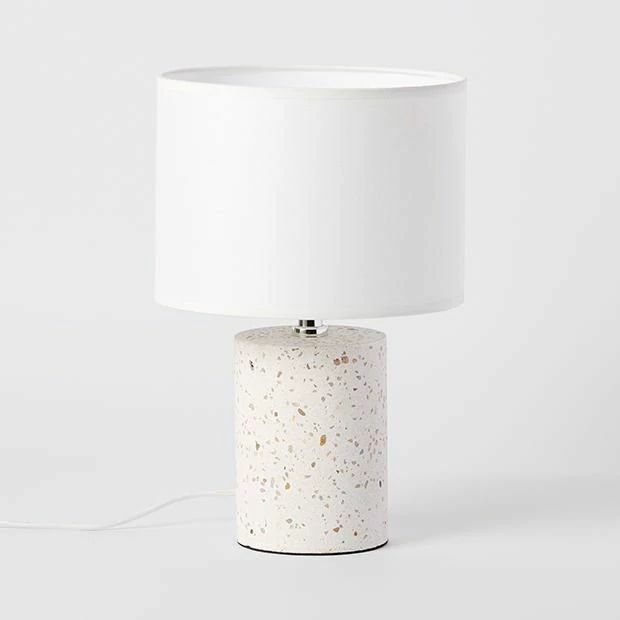 Bring a touch of terrazzo into your home for a unique and modern styling with Target’s Terrazzo Table Lamp. Featuring a concrete look base, switch on cord and felt bottom to help prevent slipping, the on-trend design will look perfect in any room. Pick this one up for only $39.00. Balance industrial angles with elegant copper tones in the Mocka Copper Lamp. This gorgeous lamp features a large exposed filament bulb, true to turn-of-the-century glamour. Fitting perfectly on a side table, night stand or cabinet, this lamp will instil warm light and cool style in any room. Just $29.95. Illuminate your living space with this on-trend table lamp. Designed with a real marble base and an elegant stem, this simple lamp will add retro flair to your indoors. Pick up this Marmo Marble Table Lamp for a bargain price of $20.00. For only $20.00, this Bonita Lamp looks super pretty sitting beside some greenery. This is a good option for the minimalist design lover. Lighten up with the Mocka Halo Desk Lamp. Available in a lovely monochrome style, this is the perfect desk or table lamp for all your lighting needs. With an adjustable shade, you can manoeuvre and pinpoint light on any object you desire. Pick up this practical style desk lamp for only $29.95. Light up your world with the Mocka Tilly Lamp. This simple, Scandi influenced table lamp fits perfectly on a side table, night stand or desk. The ideal companion for late-night bookworms and the finest finishing touch to set the atmosphere in your home. They’re so good…and at just $29.95, you’ll be wanting one for every room! Are you mad about chrome? The sharp-looking Stockholm Table Lamp is a little more expensive at $69, but it makes up for it by packing real punch, particularly in a lounge setting against blue and grey hues. The dimmer switch lets you set the mood, too. Create a welcoming, well-lit living space with this Black Plug-In Lamp. Minimalistic and classy, it blends with any decor. Great for the bedroom or study nook and a bargain at $12.00.